High quality unmounted rubber stamp from Sue Wilson. Creates crisp and clean lines. Simply mount your stamp onto an acrylic block and get stamping! Coordinates with CED4370 Frames & Tags Vivian. Cling Stamp from Impression Obsession featuring a seashell. Cling rubber stamp featuring a sea shell. Size: 1 3/8" x 1 3/8". This is a red rubber stamp that is provided with a cling mounted backing. For those unfamiliar with 'cling mount', this backing is used when adhering the stamp to a clear acrylic block. This is re-usable over and over again. All of our stamps are pressed in house in the good old USA and we take pride in making sure you get a quality product that can be enjoyed for years to come! High quality unmounted rubber stamp from Sue Wilson. Creates crisp and clean lines. Simply mount your stamp onto an acrylic block and get stamping! Coordinates with CED4372 Frames & Tags Jocelyn. Ocean themed cling stamp featuring coral and seashells. A lovely reminder of the beach life, this hibiscus flower and conch shell is reminiscent of the islands. Image measures approximately 3-3/4" X 3-3/4". Cling Stamps featuring a collection of seashells. Deep Red stamps are made of a blend of natural rubber and are attached to a cling foam pad for better definition. Approximate Size: 3.2" x 4.1". Cling rubber stamps featuring a border of Seashells. Darkroom Door Border Stamps are mounted on cling foam. Great for making borders on scrapbook pages, art journals and more! Darkroom Door rubber stamps are known for their durability, deep etching and high image detail. Lush seashells, coral and a sea star create an entire ocean reef. 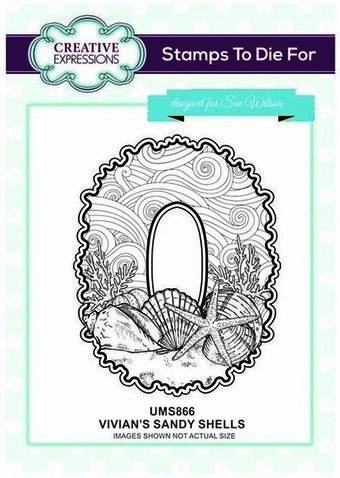 Use with your Mermaid Friends and Sailboat sets for a complete ocean scene. Includes seaweed and coral stencil/template. 6 stamps. Conch measures approximately 3-1/2" X 3". Ocean and beach themed cling rubber stamps featuring fish, coral, a seahorse, sea shells, and more. These detailed stamps are the perfect way to add fun images to your cards, scrapbook pages and more! Use with any clear acrylic block. 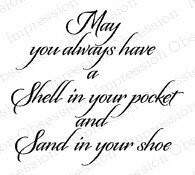 Marianne Design Background Stamp - Tiny's Seashells. 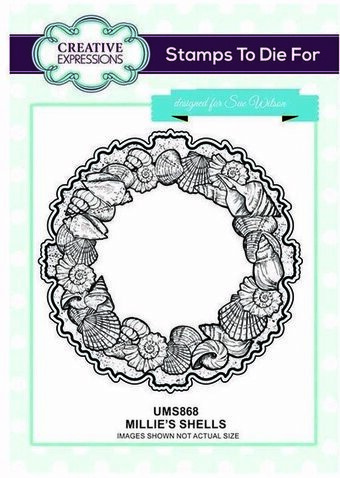 1 background stamp with random seashells. Size: 5.0" x 5.0".